This is not legal advice. Reference to legals is based solely on the author’s understanding and interpretation of law. The focus is Australian law. The primary readership for this article are people who write, photograph and video for permaculture publication including organisational newsletters, websites, blogs and social media. content refers to material appearing in print and online publications or the printed or online curricula and course material of a permaculture educator or designer. (Actual): Tagari Publishing, publisher of Bill Mollison’s book, Permaculture — A Designers’ Manual, issues a notice that permaculture organisations using the illustration on the front cover to cease doing so because the illustration is copyright; the illustration was used without permission of the publisher and, thus, contravenes Australia’s Copyright Act 1968. Australia is signatory to the international agreement on copyright, the Berne Convention for the Protection of Literary and Artistic Works. Wikipedia succinctly describes how the Convention stipulates that copyright exists the moment a work is ‘fixed’ rather than requiring registration. It also enforces a requirement that countries recognise copyrights held by the citizens of all other parties to the convention. Thus, copyright is international in scope. The Convention states that it is not necessary to register copyright in each of its 140 member countries and authorises countries to allow fair use of copyrighted works in other publications or media. Laws covering intellectual property (IP) in Australia are made by the federal government and have national jurisdiction. Copyright in Australia is administered under the Copyright Act 1968. The Act implements Australia’s participation in the international Berne Convention for the Protection of Literary and Artistic Works, commonly known as the Berne Convention. The Copyright Act 1968 covers articles, photographs, illustrations, art works, musical and artistic works and similar productions. These are automatically copyright to the person creating them or to an organisation the person is working for. This is so without applying the international copyright symbol: ©. Legally, permission needs to be sought to reproduce copyright material in a blog or on a website or other publication unless it is reproduced for editorial purposes such as reporting a story, for educational purposes or for review or criticism. There is a persistent belief that photographs or other material appearing on the worldwide web are free for anyone to use and that free use of copyright material can be made for non-commercial purposes or by crediting the source. This is incorrect unless the material is marked as being in the public domain or carries Creative Commons licence notice that stipulates how it may be used, distributed and credited. Copyright protects only the expression of an idea, such as appears in a publication or blog. Copyright does not protect information, an idea or the articulation (describing) of an idea, nor styles and techniques. Thus, the reported criticism by a permaculture publisher, some years ago, that a new book on permaculture copied the ideas appearing in its own book, did not constitute a case of copyright infringement because ides are not protected by the Copyright Act 1968. The expression of ideas, original photographs and illustrations, chapter arrangement appearing in a book or other publication will be copyright but the ideas being discussed will not. For example, a photographer making a photo of a farmer holding a garden fork in front of a field of grain would have copyright to their own photograph but not of the concept of photographing a farmer holding a garden fork in a similar setting. An author of a book may discuss ideas developed by authors of other permaculture books. permanent artworks, such as sculptures in public places and buildings are not protected by copyright so as to allow photography and incidental filming (‘freedom of panorama’); murals may be protected; freedom of panorama is the right to take and to disseminate photographs of copyrighted works (such as public sculptures and buildings) provided those photographs were taken in public spaces; a photograph or artists’ rendering is not the same as a copy of the thing itself, which is protected under copyright law. Crown copyright, the copyright applied to government materials, expires 50 years after publication. 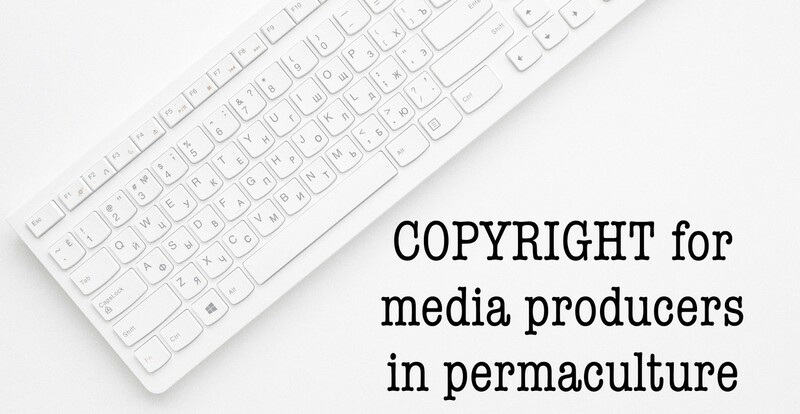 How do we deal with copyright in our work as permaculture publishers, bloggers and educators? if works are published online there is an implied licence to publish links to them in much the same way that books and articles are listed in print publications as footnotes or endnotes. Captioning photographs acknowledges their source. Doing this also asserts or acknowledges the photographer’s Moral Rights as creator of the image under the Australian Copyright Act 1968. Now and then we encounter community organisations and bloggers making use of copyright material in the belief that it is legal for not-for-profit organisations to do so. This is incorrect irrespective of whether the source is acknowledged. providing professional advice by a lawyer, patent attorney or trademark attorney. Copyright material may be used by journalists and other media workers for reporting news in a newspaper, magazine or similar periodical, digital media, in a film or for broadcast. copyright material may be used in reporting news in a newspaper, magazine or similar periodical, or in a film, or by means of a broadcast, provided the use is ‘fair’; the author and title of the work must be acknowledged. On using material published online: “Is it fair dealing if I copy material from the internet?”, you should first check the website for any statements about copyright which apply to the material you want to copy — the copyright owner may expressly allow you to print and/or download material, possibly under stated conditions. Otherwise, you may print and/or save material to disk if it is for one of the fair dealing purpose. Content creators may give permission for the reuse of their work, however this requires a direct approach by the people wanting to make use of it unless permission is stated adjacent to the work. The Creative Commons(CC) licences were developed as options for granting permission for reuse and in some cases remixing a work without approaching the copyright holder. They allow free distribution of a copyrighted work. A CC license may stipulate conditions for reuse such as attribution, non-commercial uses only, and remixing. Works under a Creative Commons licence retain copyright to their creator. The licence is an approval to make use of the work in a way stipulated. It is customary to state the type of Creative Commons licence at the end or beginning of an article or other work, much as Wikipedia does with its Creative Commons CC BY-SA 3.0 licence notice. The intention of the Copyright Act 1968 is to assert ownership of works while allowing limited use by others. The works of, and the use of the works of others by permaculture organisations, educators, bloggers and publishers is automatically covered by the Act and by its Moral Rights provision. Copyright holders wishing to share their work can state that it is issued under one of the Creative Commons licences or exists in the public domain.